Power Supplies & Regulation are used to manage voltages for your applications for both AC and DC power. Whether converting power from AC to DC or vice versa or changing voltage output one of these devices will be used to get the necessary results. 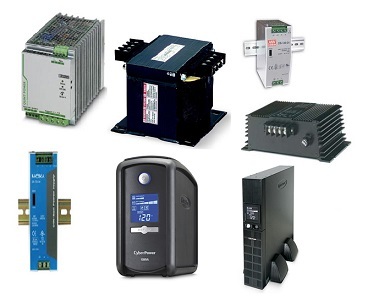 Power Supplies: The most common power supplies are DC power supplies which take AC power and covert is to DC power. In cases where you have AC power available and the hardware you are using requires DC voltage there is a power supply specifically designed to convert the AC voltage that is supplied to the DC voltage you desire. The other major factor in selecting a power supply is the amperage maximum that can be drawn buy all the devices using the supplied power of your power supply. The most common DC power supply types are switching power supplies and linear power supplies with distinctive characteristics as explained below. Switching Power Supplies are the most common because they offer the highest efficiency, lower cost, are very compact, and dissipate lower amounts of heat. The disadvantage is that noise and ripple can be higher than offered by a linear power supply. Switching power supplies are used in almost all applications except those requiring low noise levels or very sensitive equipment requiring very low voltage variations. Linear Power Supplies are used because they offer the best overall performance especially with noise and ripple. This is ideal for low power electronics and noise sensitive equipment. They are typically more expensive than switching power supplies, they expend a lot more heat requiring heat syncs that make them substantially larger, and less efficient by an average of 30-40%. A Transformer is an electrical device that uses electromagnetic induction to change the voltage of alternating current (AC) from the input to the output of the transformer. Transformers do not pass DC current and are only on AC current. Step down transformer take the primary voltage and covert to a higher secondary voltage. Step up transformers take the primary voltage and concert to a lower secondary voltage. One to One transformers have equal primary and secondary voltages and are primarily used for providing DC isolation. A DC Converter is an electrical device that converts DC power from on voltage to another. Step up converters input a DC voltage and output a higher DC voltage. Step down converters step to voltage down to a lower voltage. Step up converters step the voltage higher. And converters with the same input and output voltages are used to regenerate the voltage after long wire runs or to isolate the power.